My daughter is a little obsessed with space, and we talk about it and study it a lot. 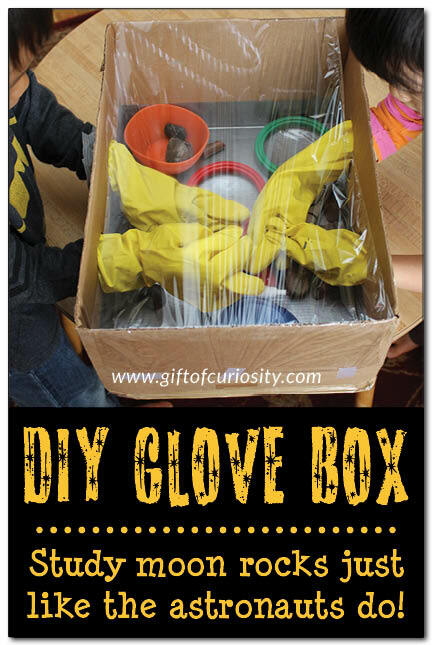 I recently came across this idea for making an astronaut glove box from Gift of Curiosity, and I just love it. Basically all you have to do is find a cardboard box, cut off the top, cut holes for arms and add some “moon rocks” and other objects for kids to discover. The top gets covered with plastic wrap so they can see through but the box is sealed, just like when real astronauts study specimens. This project was just a part of Katie’s space unit study, which includes book recommendations on topics such as space, the moon, the sun and the planets. There are also other activities including learning about how astronauts eat in space, how planets orbit the sun, how the moon got its craters, phases of the moon and, of course, a model solar system. This whole unit would be so much fun for kids! I will definitely be doing some of these activities with my little one. Have any great resources for learning about space? I’d love to see them!